Consider the shelf-life of the original Half-Life. Ten years from its initial release, the acclaimed shooter is pretty tough on the eyes, despite a half-baked port to Valve's newer Source engine in 2004. 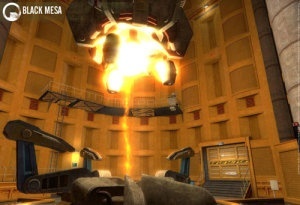 Unlike Counter-Strike, which earned a total overhaul from Valve, whether or not a Half-Life remake will ever see the light of day depends upon the efforts of determined modders at the Black Mesa Source project. Meanwhile, there's a growing audience of Half-Life 2 fans who've never even played the original game. It's a pity, because in terms of level design, atmosphere and gameplay, Half-Life still holds its own in the company of many modern releases. I've heard gamers complain that new revisions are little more than easy cash grabs by an industry afraid to introduce new content. And so they may be, in some cases. But publishers and developers who abuse beloved intellectual properties obviously do so at their own peril. Frankly, I'm more worried about the industry's penchant for cranking out phoned-in annual sequels than I am about their potential for reworking proven gaming experiences. Though it's not going to happen, I'd much rather see Ubisoft remake Beyond Good and Evil before they build another Assassin's Creed. It would probably cost them less, and I expect I'd enjoy it more. So I don't mind that Square Enix remade Final Fantasy III and IV for the Nintendo DS, or that a DS Fire Emblem remake is apparently on the way. Kudos to Square for preserving stories and gameplay that would otherwise be unavailable (or undesirable) to the average gamer. The same goes for Conker: Live and Reloaded, Metroid: Zero Mission, and any number of other titles that managed to extend the lives of their widely appreciated predecessors. I'm not even opposed to minor iterations with added content, like MGS: Subsistence, the Director's Cut of Fatal Frame II: Crimson Butterfly or the upcoming Chronicles of Riddick: Assault on Dark Athena. My response to gamers who complain that they're being asked to buy new versions of the same games they purchased a couple of years ago is, if they're not worth your money, don't buy them. You'll have lost nothing. Meanwhile, consumers who didn't catch these games the first time around or that will appreciate them in their updated forms have that option. I've got my own list of games I'd love to see remade. I'm looking forward to Fallout 3, but I'd really like to revisit Fallout's original wasteland with updated graphics and controls. I'd gladly run screaming from homicidal monkeys in a lovingly rebuilt next-gen System Shock 2. I long for an Ocarina of Time without rough polygons and muddy textures. And I'd happily re-buy a minor revision of Ico every five years for as long as I'm gaming. Until gaming reaches some sort of long-term technical plateau, remakes like Rez HD might be the best way to keep important gaming experiences from becoming distant memories. Rez HD doesn't just capitalize on the original's reputation. It helps cement and preserve it. Without it, we'd be reminiscing about when Rez was cool. With it, we don't have to.